Thisweek, all eyes will be on one private spaceflight company. TheHawthorne, Calif.-based Space Exploration Technologies, or SpaceX, is makingfinal preparations for the launch of its Falcon 9 rocket and new Dragonspace capsule on what could be a groundbreaking test flight for the entirecommercial spaceflight industry. Liftoff is set for Wednesday from the CapeCanaveral Air Force Station in Florida. Ifsuccessful, the flight will mark the first time a private company has launchedand re-entered a spacecraft from low-Earth orbit. "It'sa milestone on the path to realizing the first commercial human spaceflightcapability," Bretton Alexander, president of the Commercial SpaceflightFederation, told SPACE.com. "It's historic in that it's the beginning of aparadigm shift from a government human spaceflight architecture to one thatopens up human spaceflight to the private sector." Theplanned launch has been delayed from Tuesday due to cracks in the Falcon 9'ssecond-stage rocket engine nozzle. 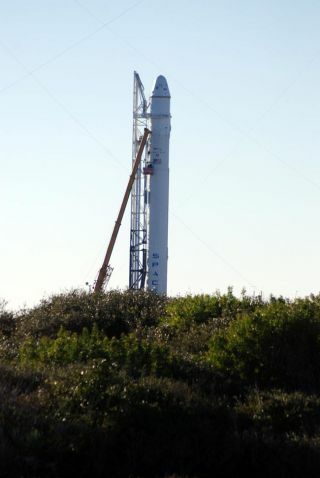 Engineers are working to investigate theproblem and hope to have it resolved in time for a possible Wednesday or ThursdayDragon launch attempt, NASA and SpaceX officials have said. "Ithink it will be good not only for Space X, but for all of the newer commercialspace companies," said former NASA astronaut Leroy Chiao, who served onthe White House committee that reviewed NASA's space exploration plans for theObama administration. "Right or wrong, many people tend to think ofall of the relatively new players as one group. So, a success or a failureaffects everyone." "Ifthey're successful, it will be a huge step forward and a feather in the cap ofSpaceX," said Roger Launius, senior curator in the division of spacehistory at the Smithsonian Institution's National Air and Space Museum in Washington,D.C. "If it's successful, we'll be that much farther down the road towarddeveloping a new launcher that has potential to carry cargo to the station, andmaybe even crews at some point." SpaceXalready has a $1.6 billion contract with NASA to provide cargo flights to thespace station using the company's Dragon capsule. Thehope is that commercial providers such as SpaceX will help fill the gap createdwhen NASA stops flying space shuttle missions next year. Until privatespaceships are available, NASA will have to rely on Russian Soyuz spacecraft totransport astronauts to space. SpaceXplans to fly at least 12 unmanned missions to ferry supplies to theInternational Space Station. And, while the Dragon capsule is not yet man-ratedto carry human passengers into space, the company ultimately aims to win acontract to fly astronauts to the station as well. "Successfulrecovery of Dragon would bode very well for future astronaut transport," SpaceXfounder Elon Musk, who made his fortune as co-founder of PayPal, toldSPACE.com in an e-mail. "Once shuttle retires, Dragon will be the onlyspacecraft [capable] of returning humans to Earth apart from Soyuz. Since a launchescape system is not needed after ascent, in principle Dragon could very easilybe converted to a lifeboat with more than twice the capacity of Soyuz (seven inour case vs. three for Soyuz)." Recently,the U.S. Federal Aviation Administration, which oversees commercial spacetransportation, awarded SpaceX the first-ever commercial license to re-enterspaceships from Earth orbit. "TheFAA license itself is a small milestone, but it's one more important andnecessary step to really changing the way human spaceflight is done,"Alexander said. Still,with commercial spaceflight still very much in its infancy, SpaceX's upcomingtest demonstration has more than just an unmanned capsule riding on its rocket. "It'shard to overstate the importance," Alexander said. "But, the realityis that it's a test program, and there are always issues with test programs.One would expect issues to crop up, but because it's the beginning of theindustry, this is incredibly important." InJune, SpaceX conducted a successfulflight test of Falcon 9 with a more simplified version of the Dragonspacecraft on board. The flight went off largely without a hitch, but Alexandercautioned that expectations for any program in its test stage should becontrolled. "There'san expectation that you're going to have issues, and when it goes incredibly well,it's fantastic," he explained. "But if you look back at the historyof government activities even, all previous space programs have had issues ?it's to be expected." "Let'sremember, first flights of most rockets fail," Launius said. "IfSpaceX is not successful, it's simply an indication that they're following awell worn path of previous design efforts. It doesn't mean that this is thewrong strategy, it just means there's more work to do." Somespaceflight experts, however, see dire political implications ? specifically forNASA's plan to rely on commercial spaceships for astronaut transportation afterthe space shuttle fleet is retired next year. "Inthe short term, it undermines whatever support there is for a commercialapproach to human spaceflight, at least by the government," said spacepolicy expert Roger Handberg, political science professor at the University ofCentral Florida. Afailure could also hit NASA hard as well, Handberg told SPACE.com. With thespace shuttle retiring next and the previous moon-oriented Constellation spaceexploration plan cancelled, it is not a given that Congress would support new fundinginto the agency's spaceflight future if its commercial investments fail, headded. Infact, SpaceX's prelaunch activities hit a few snags during engine tests Fridayand Saturday, less than a week before the scheduled launch. Two attempts atso-called static fire tests were aborted on Friday and Saturday before a thirdfinally went smoothly. Thefirst test failed because one of the Falcon 9's engines experienced elevatedchamber pressure, while the second was aborted due to low pressure in the gasgenerator of one of the rocket's engines. Aftermaking adjustments, the company was able to complete a full-duration staticfire test later that morning. "Ithink there is a tendency to treat each mission as make or break when a newcompany like SpaceX joins the field, but no one flight is that important,"Musk said. "Most of the successful launch vehicles experience a failure inone of their first three flights before going on to be very successful. Theseare test flights, and so the information that we gain from them is far moreimportant than whether or not we meet all of our mission objectives." Yet,if Tuesday's test flight is deemed a success, it will undoubtedly be a historicbenchmark that paves the way for the future of commercial spaceflight, expertssaid. "Thiswould represent an important milestone in the history of space, heralding thedawn of a new era where private companies can now bring back spacecraft fromorbit," Musk said. Andperhaps that time cannot come soon enough. With the retirement of NASA's spaceshuttle fleet close on the horizon, the stakes are raised for who and what willprovide the follow-on spaceflight capability after the shuttle era comes to anend. Andtest flights aren't the only challenges the burgeoning industry must face:Political factors loom as well. A NASA authorization bill recently passed by Congressallocates money for private spaceflight, but the bill is still waiting forappropriations from Congress. "Thegap in human spaceflight is now entirely in the hands of Congress and what theydo with appropriations," Alexander said. "The NASA authorization billthat was passed recognized the importance of this and made commercial crewprimary, but things are still up in the air." Youcan follow SPACE.com Staff Writer Denise Chow on Twitter @denisechow. Visit SPACE.com for complete coverage ofSpaceX's debut Dragon spacecraft launch.